Paternal Bond is life-long relationship between child and father. Everybody talks about maternal bond, the attachment between mother and a child. While the mother-child bond is super important, the father many times is kinda left out from all the baby touching, bonding, kissing, feeding. When does the father bonding begin? There are 3 stages when fathers can bond with their children. Womb bonding happens during pregnancy. According to the studies, ultrasound can play an important role for a paternal bond. Talking, singing, touching mother’s belly also help for a father to create a bond with a baby. Birth bonding happens right after birth. It depends on how much father is involved into the labour and whole pregnancy process. “First soccer practice – age” bonding. If it happens later, don’t sweat it. Better late than never, because the relationship a father will have with his son/daughter will influence child’s life greatly. Unfortunately, babies do not come with “instructions how to use”. For many dads a screaming baby with a full diaper might seem like mission impossible. Talk about bonding when the father is scared to hold the baby. But with the right guidance you will see that there is nothing more natural and pure simple than bonding with your child. So, read these tips and start bonding! baby massage. In fact, recent study shows that baby massage not only helps to bond but also reduces stress for dads. Babies like company, so just be near your child. Keep him company by giving baby a lot of eye contact and facial expression. According to the study babies (starting when they are 30 weeks in the womb) can distinguish between parents and strangers voices. To fathers luck, their voices are more recognizable than mother’s because of their lower tone which is easier for babies to recognize. Of course, your baby won’t understand a word you are saying in the beginning, but he will definitely get familiar with your voice tone. Try baby talk – short and simple words or imitate the noises your baby makes. Going for a family walk? Volunteer to carry a baby in a carrier. ‘Baby wearing’ is very beneficial for both: a child and a parent (this case – father). Skin-to-skin contact is also very important to paternal bonding. Have your newborn lay on your naked chest while you rock in a chair. Taking a bath together with your baby might seem scary because of all that slippery skin and baby fussiness, but with the little mommy help you guys off to fun bath times! Even if a baby screams non-stop and his diaper changing situation is turning into a bomb explosion – you can still do it. Baby needs to trust that you can help him in all situations. Practice and practice. The more you change that diaper – the better you will get. Be a good partner to your spouse. Happy wife – happy life. Try to give her breaks as much as possible, be sensitive and caring. We know that mother-child bond is very important but what about father-child bond? makes child more social and psychologically stronger. A father who is bonding with his child shows deep commitment to his family, therefore the relationship between partners gains more trust, becomes deeper and jumps to a whole new level – a parenting level. You think only women have hormones during pregnancy and after birth? Well, here are some news, for you guys too. 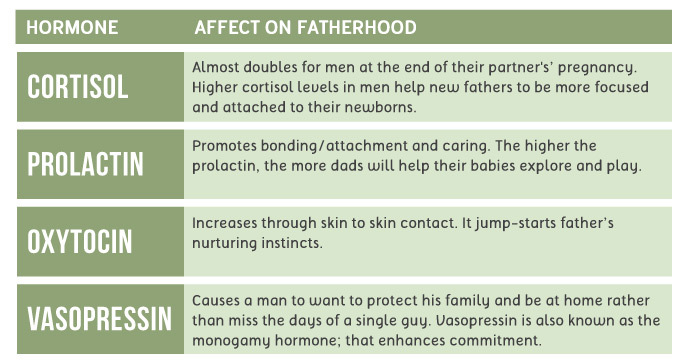 According to the study, fathers experience an increase in their levels of these hormones. Study also found that father’s testosterone levels decrease by one-third immediately after they become fathers, providing a calming effect that may make them less likely to stray from home. So, it is natural that during women’s pregnancy her partner losses little bit of his strong male attitude and gains more nurturing nature which of course helps a lot for paternal bond process. So according to the science a father who is involved closely during pregnancy, birth and early infancy will be helped my Mother Nature and its hormones to become sensitive and protective father that not only child and mother will benefit but also the whole society. This father transformation is one of the most difficult but the most rewarding challenges a man will ever experience. So be confident, get support and feel safe to experience successful paternal bond.